“Double Happiness” brand Hakka [客家] playing cards made by Xiang Fa Company (used by Hakka ethnic communities who have a separate identity from the Cantonese people), 38 cards, 2000. 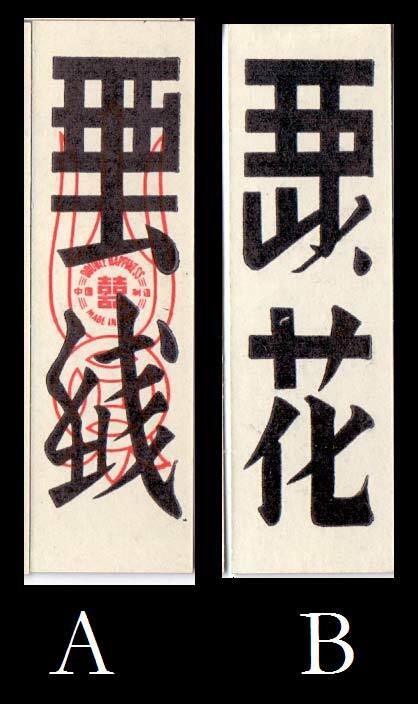 The wrapper of the Hakka playing cards (right) shows the phrase: "中國江蘇製造” (Made in Jiangsu, China). Above: general overview showing the cards arranged according to rank and suit. On the right you see the two extra cards in the deck. Each of the cards has two symbols, one on the top, and another at the bottom. The one at the top displays the value of the card, the bottom one its suit. The suits of this deck, like mahjong, are based on ancient Chinese coinage. The lowest value, single coins, marked by the word 綫 , meaning "Thread" The word should by right be 錢 ( which is the Chinese for coin), the characters got mixed up some time in the past. The next highest value 100s of coins is marked, 索 = rope, or cable. This is a reference to the practice of stringing up coins in bundles of 100. Above that we find Guan, 貫, meaning a string of ten thousand coins. Highest of all is 拾 a word meaning 10, but in this context implies a bunch of 100,000 coins. Note that the Chinese word for 100,000 is 萬, the third suit in Mahjongg. Above: numbers are shown on the top row, the suit signs on the bottom. The number signs can be recognized as Chinese characters, albeit very stylized ones. Note that beneath the the circular symbol of the Aces is the phrase “ 中國江蘇製造” - Made in Jiangsu, China, which also occurs on the wrapper on the deck. The suit signs are simply the cursive versions of the respective Chinese characters. The only exception is the sign for the suit of 貫 which is slightly stylized. However, there are exceptions. The Ace in the suit of 拾 is marked 百子, " A hundred children", instead of using the expected sign. The ace in the suit of coins, is more mysterious. The first character is definitely毛, Mao , meaning hair. It can also be a surname ( think Mao Zedong ). The second character is ambiguous. One source suggests 公, meaning duke. If this is true, then the inscription would read "Duke Mao". Right: the two extra cards of the deck. The bottom character in card A is definitely 綫 ("Thread"), and the bottom character in card B is 花 (flower). However, the top characters in both cards have defied all attempts at interpretation. Left: decipherinng some of the inscriptions on the deck. In the first row, we see the maker's name is written across the 6s in the deck, 祥發公司-- Xiang fa company. In the second row, you see the name of the company, 祥發 written on some of the cards. These two characters when taken alone, mean "happiness" and "To flourish", respectively. In the third row, we see the words 大字纸牌 written across the 2s in the deck. This means "Big character playing cards". Note that, in order for any of the inscriptions to make sense, the suits cannot be arranged in the order described above. Why this is so, I do not know. 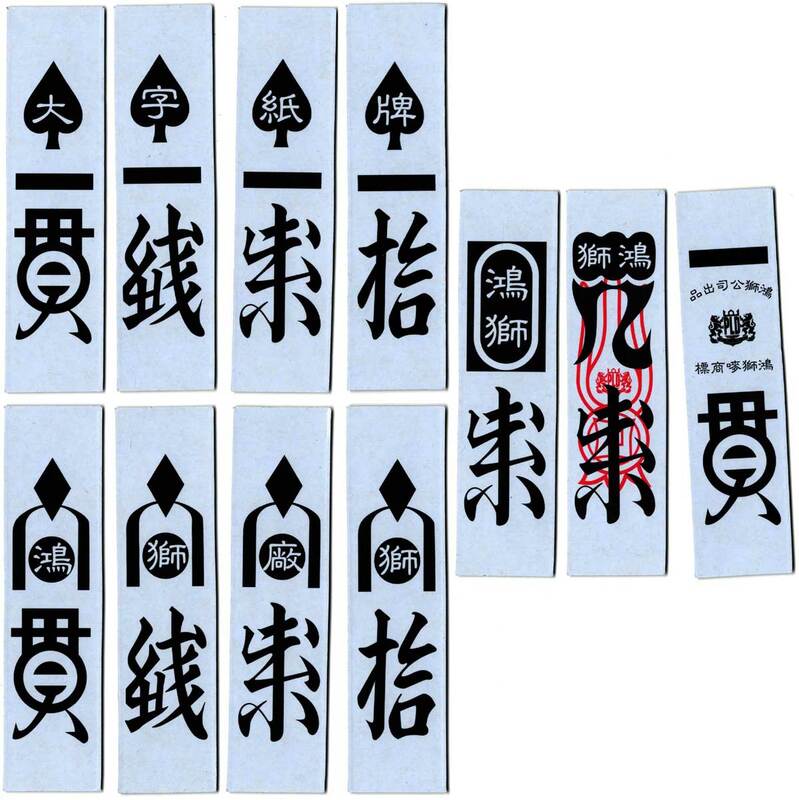 Apart from being called 客家牌 (Hakka cards in Chinese) these cards are sometimes called 六虎牌 "Six tiger cards", as one of the games that uses these cards is called "Six tigers". Above: 六虎牌 Six Tiger cards made by Hong Shi 鴻獅, Guangdong province. 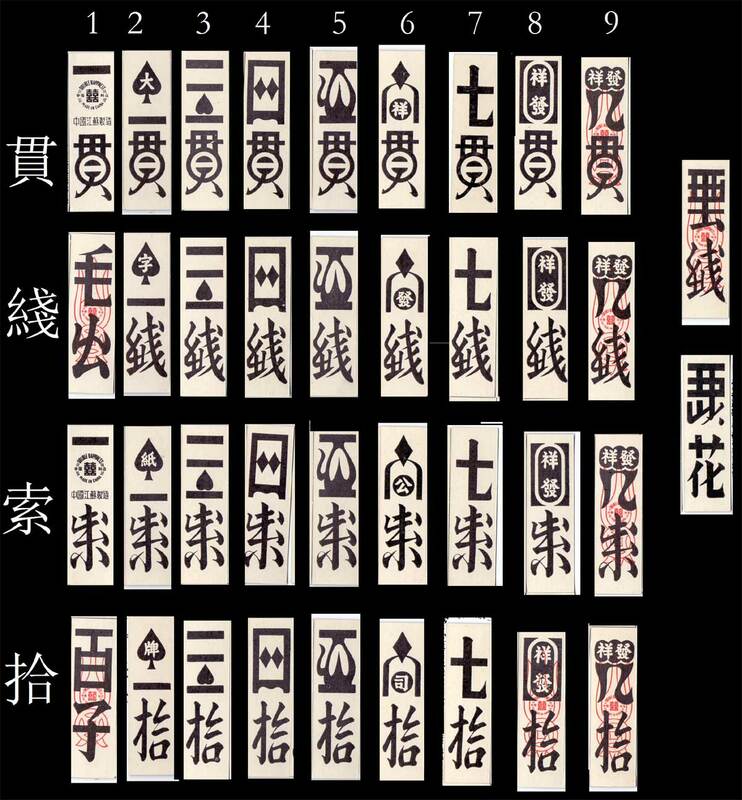 The inscriptions are the same as before: 大字紙牌 on the 2s of each suit (top row). Rather pleasingly, the order you have to arrange the suits in to reead the inscription is the same in both the Hong Shi and Double Happiness decks. The maker’s name is written on the 8s and 9s of each suit. The ace bears the maker’s stamp (row offset to the right: cards shown are, in order, 8 and 9 of ropes and the ace of Guan). The maker’s name is also added on the 6s of each suit (bottom row). The Three of the cards read 鴻獅廠 "Hong Shi Factory". The fourth card reads 獅, "Lion" again. As for the cards themselves, they are made from a fairly thick cardstock (approximately double the thickness of normal cardstock) and have a pleasing glossy finish. Their backs are plain black in colour. The package is shown below. Above: Top left: 鴻獅六虎牌 Hong Shi Six Tiger cards. 2nd image: The company's address and contact number: Guangdong province, Dongguan city, Huangjiang Town, Huang Jin Keng village, Bai Shun street, Bai shun industrial district Phone Number : 18122800488. The makers sell two types of six tiger cards; an "Original" edition, and a slightly wider "Luxury" edition. The cards shown above are from the Original edition. Images and notes courtesy Anthony Lee.